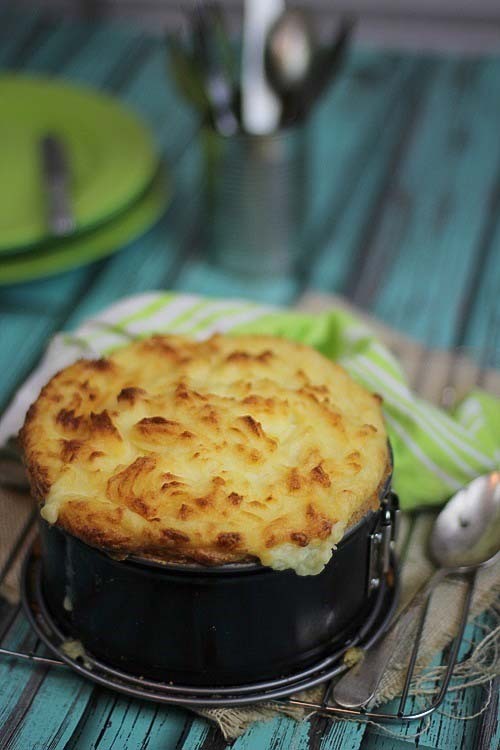 This is a kind of new world Shepard’s Pie and it’s a real winner. It’s full of Chicken and vegetables and it is topped with feta mash. How does that sound?. If that weren’t enough it is encased in my Hot water crust- the true pie pastry. Well in my house anyway, no matter the weather a pie is always welcome. This pie is the ants pants. It has it all. The vegetables are foremost (not that anyone around here noticed it was green), and then a quick cooking chicken base. 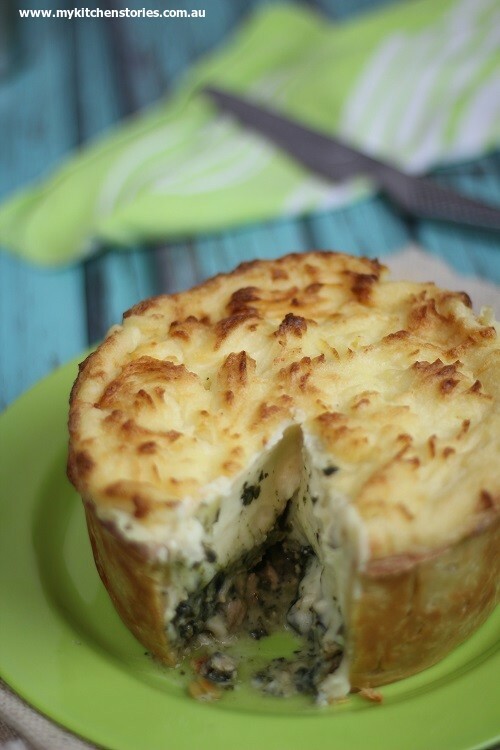 It is topped off with our new favourite – feta mash, and wrapped in a supportive hot water crust. This is a very forgiving pastry and one for which you’ll want to keep the recipe. I know you will love it. Just so you know, it isn’t one of those Jamie Oliver 15 minute meals. No, it will take a little bit of commitment to put it together. The good thing is that it is easily reheated read excellent left overs! 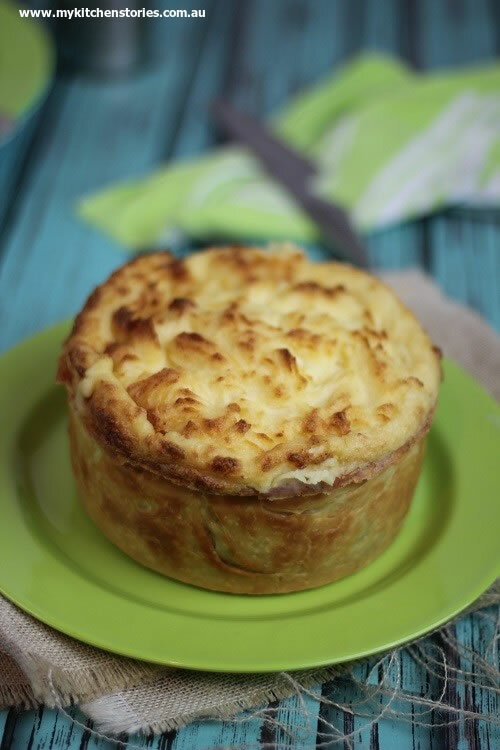 In fact, even though it took me about 1 hour to make, the next couple of days were easy as ….pie. It lasted for several meals. Even though it looks pretty fancy it doesn’t use any ingredients that are hard to find, so make it when you have just a little extra time. Follow the step by step instructions to the Hot Water Crust pastry and I think you might make this a little more often than you expected. This pastry has seriously good ratings. 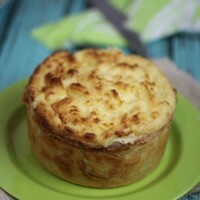 This is a kind of new world Shepards Pie it's a real winner. It's full of Chicken and vegetables and it is topped with feta mash. how does that sound?. If that weren't enough it is encased in my Hot water crust- the true pie pastry. I used a cake tin with a removable bottom for this, 10 inch or 20 cm. I like the look it gives, but you could use a pie dish. Have your pastry ready for this before you start. You can make it a day or two before you need it! 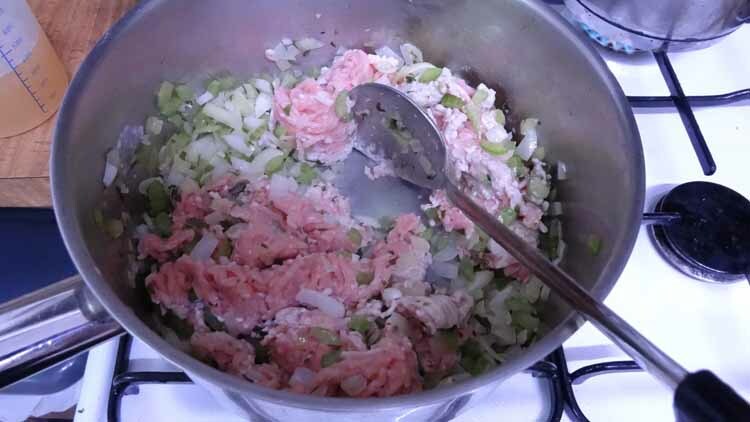 Put a medium pot on the heat and add the olive oil the onion, garlic, celery and oregano. Sweat it gently for 5 minutes or till soft add the chicken and break up a bit while stirring until it starts to colour. 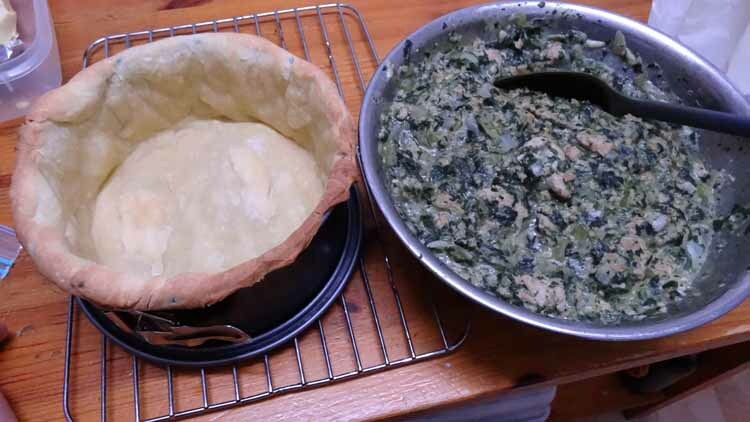 Add the flour and stir through and heat well before adding ¾ of the stock and the spinach. 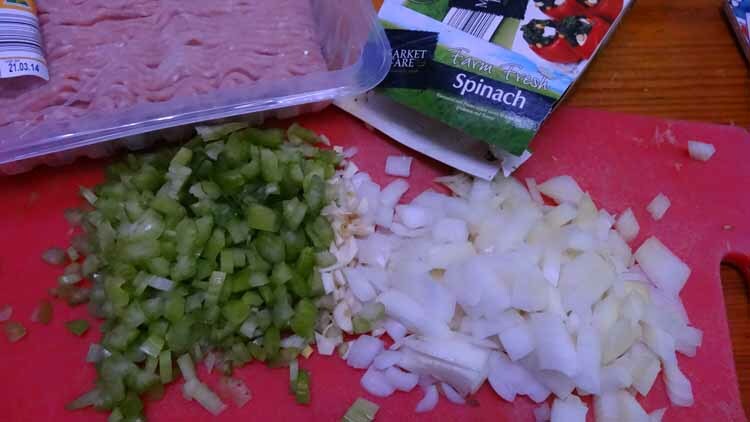 Keep stirring and breaking down the spinach and the sauce thickens. Season well tasting as you go. Stand aside while you finish the mash. While the chicken is cooking put the potatoes on to steam. Prepare the feta mixture by breaking it up into the milk. warm the milk in a saucepan slowly or use the microwave till just warm- don't boil, then break up the feta with a fork and mix through the milk. Once the potatoes are riced or mashed add the butter and salt. Mix well then start to add the milk. Mixing well and continue to add till it's all gone. Taste for salt and pepper. Add if needed. Finally break the yolk with a fork and mix in 1 Tablespoon water then whisk it briskly through the potato till incorporated. Bake for 30-40 minutes or until golden and bubbling. Test the internal temperature is around 80 C or by poking a knife into the centre of the pie after 30 minutes, feel the knife to test the temperature of the centre of the pie. Remember the filling is already cooked. You can make both the filling and the mash ahead and cool them down, using them when you want to. Make sure the filling isn't extremely hot when you ad it to the pastry. let it cool down a little. This will help the pastry cook better and crisp up on the bottom. It’s always pie weather here-I’ll eat pies any time of the day and during any season. The feta mash sounds lovely!